I fear progressing in my practice of chi kung, because I don’t know where I shall be on the way. Your fear is not only unnecessary but also unfounded. Just practice your chi kung following the three golden rules of practice, which are not to worry, not to intellectualize, and to enjoy your practice, and you will have good health, vitality and longevity. The first rule, “not to worry”, means you need not worry whether you are on the way. The second rule, “not to intellectualize”, means you need not intellectualize whether you are on the way, or where the way will lead you to. But I shall still tell you where the way will lead you to. It will lead you to good health, vitality and longevity. The third rule, “enjoy your practice”, is self-explanatory. If you don’t enjoy your practice, or if you are indifferent to your practice, you are not following the three golden rules. Why will the way lead you to good health, vitality and longevity? That is because that is the way chi kung is. As an analogy, when you are hungry, eating some food will satisfy your hunger. If you are driving along a road to Moscow, you will eventually reach Moscow. Why will eating some food satisfy your hunger, or driving along the road to Moscow will enable you to reach Moscow? It is because that is the way eating some food and driving to Moscow is. My mind thinks around trying to understand the experiences of meditation and compare my thinking with life. For the most part, I just can’t. For example, a human is just another animal living on a basis of stimulus-response without having a real choice because there is no one who can make it, and emotions and thoughts arise spontaneously. This makes me depressed. Can you please give me advice? The reason you do not think well is that your thinking is wrong. The reason you are depressed is that, regardless of whether your thinking is right or wrong, you do not enjoy your thinking. Your thinking is wrong because a human is not just another animal. The human is also not living on a basic of stimulus-response. It is also wrong to think that he has no real choice. Fourthly it is wrong to think that no one can make it, i.e. making a choice based on stimulus-response. It is also wrong to think that emotions and thoughts arise spontaneously. I am quite sure you are a human. So, let us take you as an example. You are not just another animal. No animals, for example, can write an e-mail to me and ask me questions. In fact, you are unique. No other humans, and certainly no other animals, are like you. You do not live on a basic of stimulus-response. If someone rings a bell, like the case of Pavlov’s dogs for example, you do not necessarily eat the food provided. You have many choices. Regarding the food, you can throw it away, throw it to the provider, go out to buy the type of food you like to eat, and so on. You also can make it. If food is provided, you can eat it. If for any reason you do not want to eat the food, you also can make it, i.e. you do not eat the food. Emotions and thoughts may arise in you spontaneously, or they may not. I believe your thoughts of these questions did not arise spontaneously. You made some effort to think of these questions. They did not arise by themselves. If the ideas you think make you depressed, then don’t think of these ideas. Think of ideas that make you happy. As a human, it is not difficult to think of happy ideas, irrespective of whether these ideas will become real. It also does not need high intelligence to do so, unless you choose to think of intelligent ideas. Isn’t enlightenment the goal of the Shaolin arts as well? Attaining Enlightenment was the goal of the Shaolin arts at the Shaolin Monastery in the past. But in Shaolin Wahnam today, attaining Enlightenment is not the goal of our Shaolin arts. Enlightenment here means perfect transcendentality where there is no differentiation into myriad identities. The goal of our Shaolin arts is to have good health, vitality, longevity, poak performance and spiritual joys in our phenomenal world. 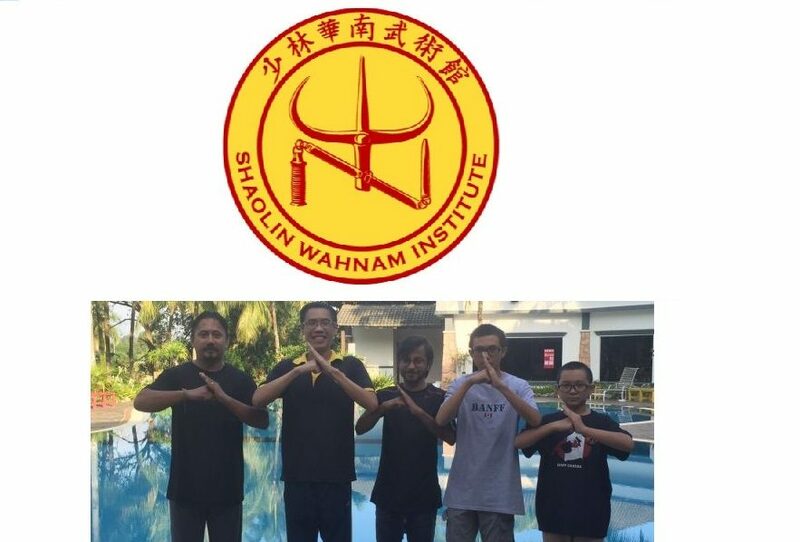 Many of our Shaolin Wahnam members have experiences of spiritual awakening, or a glimpse of Enlightenment, but we are not ready for Enlightenment yet. During standing meditation, when I am not thinking of anything, when I smile from the heart and am physically relaxed as best as I can, I am not actively doing anything but am in the moment. I mean that I am perceiving or noticing things, but in a greater quantity and quality than during normal daily life, which is just like during Vipassana meditation. Then I remember your advice about stopping sitting meditation, and I don’t know if I should do that and let the observation happen, which I feel like practicing Vipassana unintentionally. Can you please give me advice? Yes, I can give you advice, and my advice is always based on the interest of the person who asks me for advice. But whether you, or anybody, follow my advice is your choice and your right. It is also not my business to ensure that you, or anybody else, follow my advice. My advice for you to stop Vipassana mediation was because it was making you dull and depressed. I also make it very clear that it was not because Vipassana meditation was not good, but because it was not suitable for you at the time when I gave you the advice, and also now when you ask me for more advice. Similsrly, if our chi kung brings you harm instead of benefit, I would also ask you to stop practicing our chi kung. Vipassana meditation is good for Theravada monks who have renounced family life to cultivate for Enlightenment. If you were in such a situation, when you became a Theravada monk and had renounced family life to cultivate for Enlightenment, though I would not recommend you to do this, Vipassana meditation would be suitable for you. Our standing meditation and smiling from the heart are different form Vipassana meditation, though some of the benefits may be similar. Practicing our chi kung is also very different from practicing Vipassana meditation, even unintentionally. Editorial Note: Franz’ other questions can be found in the following issued, July 2017 Part 3, of the Question-Answer Series. Sifu, you said that being free from irrelevant thoughts is a necessary condition for performing chi kung. I have hundreds of thoughts crossing my mind How do I eliminate them? Yours is a common problem among many people. They complain that they are troubled by hundreds of thoughts in their daily life, specially when they are not performing any specific tasks. But once they have learned from our school they overcome their problem. You also have done well. In the chi kung session just now, you had a beautiful chi flow. If you had hundreds of thoughts crossing your mind, you would not have any chi flow. Being free from irrelevant thoughts is a necessary condition for practicing chi kung, and chi flow is the essence. The other condition is to be relaxed. In other words, if a person has hundreds of thoughts crossing his mind, or he is tensed, he would not be practicing chi kung; he practices gentle physical exercise using chi kung techniques. A sure way to eliminate irrelevant thoughts is to stop each thought as soon as it arises. You may not stop all the thoughts at once; you would need time to do so. Suppose you have 500 thoughts in 10 minutes. For the first day you succeed in stopping 5 thoughts. So you have 495 thoughts for that day instead of 500. The second day you do better. You can stop 8 thoughts, leaving you 483 thoughts. But on the third day, for whatever reasons, you do not perform as well. 3 extra thoughts creep into your mind, resulting in you having 486 thoughts. There may be rise and fall in the number of thoughts in your mind, but generally the trend is that your thoughts become less and less. If you persists doing this every day, in about 3 months you will have eliminate most of your thoughts. This method is simple, though it needs perseverance. If you want to succeed, you must continue performing this method every day for a few months. Why, then, many people have many thoughts troubling their mind? There are two reasons. One, they do not know of this method. Two, they do not persist enough. They attempt this method every day for a few days, then stop practicing. Sifu, Sinew Metamorphosis develops tremendous amount of internal force in a very short time. There is also no visualization and no special breathing methods involved. What mechanics are involved to make Sinew Metamorphosis so very powerful? This is an excellent question. In fact, I have been waiting for such a question. Many people have expressed amazement at the tremendous force developed from Sinew Metamorphosis in just a minute or two but so far no one has asked me how. There are three dimensions in any internal force development, namely form, energy and mind. The division into these three dimension is for easy understanding. Actually all the dimensions are involved in any internal force development, or in any chi kung exercise. 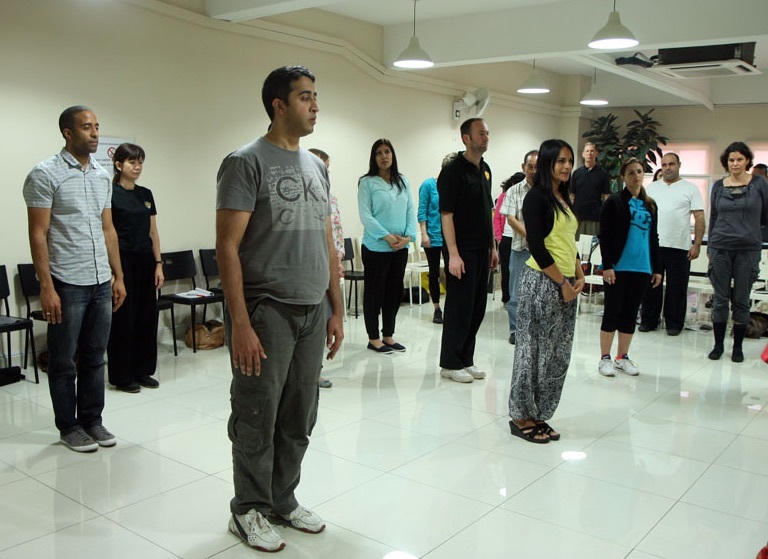 For example, the most basic method of developing internal force is the Horse-Riding Stance or the Three-Circle Stance in Taijiquan today. These stances are usually regarded as the form dimension. But the energy and the mind dimensions are also involved. A practitioner lets his breathing be nautral, which is the energy dimension. His mind is focused at his dan tian or at nothingness, which is the mind dimension. If his breathing is forced, or his mind wandering, his result will be greatly hampered. To illustrate the operation of these three dimensions in force training, let us take Lifting Water as an example. If we only perform the form of Lifting Water in a relaxed manner we can develop some internal force. This is the form dimension. If we regulate our breath while performing Lifting Water in a relaxed manner, we can develop more internal force. We breathe in gently through the nose when lifting up our hands, and breathe our gently through the mouth when lowering the hands. If we are deeply involved in performing Lifting Water, even without regulating our breath, we produce the most internal force. This is the mind dimension. We enter into a chi kung state of mind, or enter Tao in Taijiquan context, or enter Zen in Shaolin context. Outwardly the mind dimension may appear to be similar to the form dimension. But the difference is that in the form dimension we do not enter deeply into a chi kung state of mind, whereas we do so in the mind dimension. All this information provides the background which is useful to understand the answer thoroughly. Now is the answer to your question. A rough estimate of the internal force a practitioner can obtain from the form, energy and mind dimensions is 1, 3 and 6 respectvely. If he works only at the form level, he gets 10% of the internal force; if he works only at the energy level he gets 30%; and at the mind level, 60%. The internal force generated in Sinew Metamorphosis practiced by us in our school is 100%, which is 10 times more than what others get at the form level. Why is it at 100% and not at 60%? It is because our practice also includes internal force derived at the form level and the energy level, although we do not regulate our breathing nor perform any visualization. The form level is obvious. In fact, this is what most other students do if they perform Sinew Metamorphosis correctly, and not merely perform the external forms of Sinew Metamorphosis. This was what I did when I practiced Sinew Metamorphosis as a student. I had to perform each exercise 49 times, and there were 12 exercises. It took me about an hour to complete the Sinew Metamorphosis training. Yet the internal force I developed from my one-hour Sinew Metamorphosis training was just about one-tenth of the internal force our students now develop in performing just 1 exercise 6 times in 5 minutes. It is mind-blowing but true, and of course I am very happy for our students. Why was my internal force from Sinew Metamorphosis in 1 hour only one-tenth that of our students now in 5 minutes? The reason is that I performed Sinew Metamorphosis at the form level, whereas our students perform Sinew Metamorphosis at the mind level, which includes the form level and the energy level, and which also takes less time. What mechanics are involved to make Sinew Metamorphosis in our school so very powerful and in such a very short time? Let us take “Flicking Fingers”, or “Golden Dragons Tap on Ground”, as an example. At the ready position, our fingers are bent to the fullest. Thus, when we flick our fingers, it is not just physical movement though we actually do it, but we channel energy to flow up the 3 hand yang meridians. These three hand yang meridians activate energy flow along the three leg yang meridians down the whole body to the toes. At the toes, the three leg yang meridians activate the flow of the three leg yin meridians up the leg and into the body, where they activate the three hand yin meridians to flow to the inner side of the arms to continue at the fingers with the three hand yang meridians. Hence, by just flicking the fingers, without regulating the breath, energy flows through all the twelve primary meridians, completing the phenomenal big universal energy flow. This vigorous energy flow throughout all the twelve primary meridians not only generate a lot of internal force but also give us good health, vitality and longevity. This phenomenal big universal energy flow is enhanced many times when we are deep in Zen, or a chi kung state of mind. It is a common misconception that one operates at the mind level by visualization. This is not so, as is exhibited in “Flicking fingers” or any of the Sinew Metamorphosis exercises. The deeper a practitioner is in Zen or a chi kung state of mind, the greater is the amount of internal force generated. Sinew Metamorphosis is an excellent example showing that a tremendous amount of internal force is generated without using any visualization or breathing methods. How do we enter into a chi kung state of mind? Like many things in our school, it is easier done than said, whereas to many other people it is easier said than done. 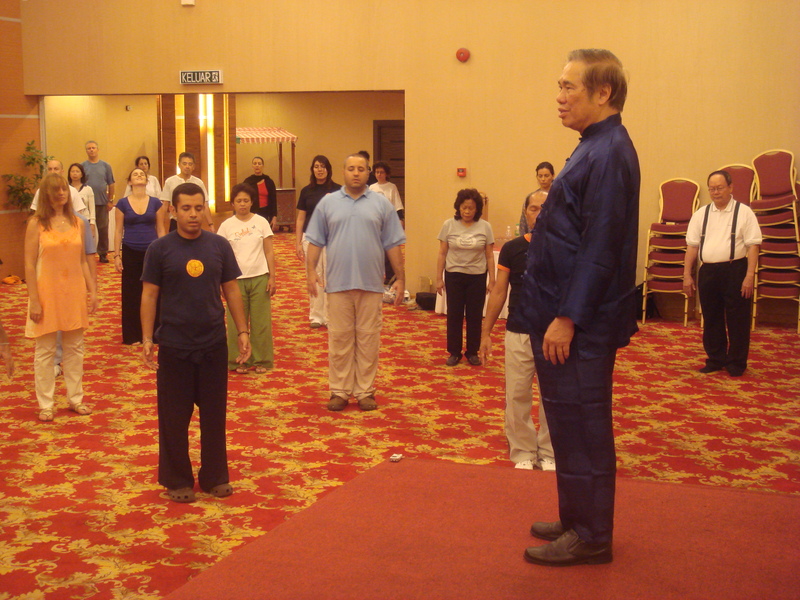 All students who have attended our courses can enter into a chi kung state of mind easily, otherwise they cannot perform chi kung; they only perform gentle physical exercise using chi kung techniques. You too, entered into a chi kung state of mind just now. You had a good chi flow. If you did not enter into a chi kung state of mind, you would be unable to enjoy a chi flow. Nevertheless, I shall give you an academic answer here. Just do two things, and you shall enter into a chi kung state of mind. Relax and don’t think of anything. If you are relaxed and your mind free of irrelevant thoughts, you will be in a chi kung state of mind. If you are relaxed and free of irrelevant thoughts long enough, your chi will naturally flow. If you follow the chi flow movement, you will enjoy a good chi flow. It is worthy of note that entering a chi kung state of mind does not necessary mean you will have a chi flow. One has to be in a chi kung state of mind to have a chi flow, but being in a chi kung state of mind does not necessary mean a chi flow. Similarly, one has to open his moth to eat something, but opening his mouth does not necessary mean he will eat something. If chi kung is so good, why aren’t a lot of people rushing to learn it? There are three main reasons. Firstly, chi kung in the past was exclusive. It was a rare opportunity to practice chi kung. Hence, very few people today practice genuine chi kung, and fewer still teach it. We are indeed very fortunate to inherit this rare art from the Shaolin Monastery. Secondly, most people who practice chi kung today do not have good results. Even many chi kung instructors today take medication on a routine basic, and most of them do not exhibit the kind of vitality chi kung is meant to give. Why is it that they become chi kung instructors when they themselves do not practice genuine chi kung that gives the results of good health, vitality and longevity? A main reason is that they only learn external chi kung forms. Their techniques are genuine, but they lack the skills to perform their chi kung techniques to generate energy flow to have good health, vitality and longevity. Hence, they teach external chi kung forms without energy flow to their students, and both the instructors and students do not realize this fact. It is the energy flow that gives good health, vitality and longevity; not the techniques. 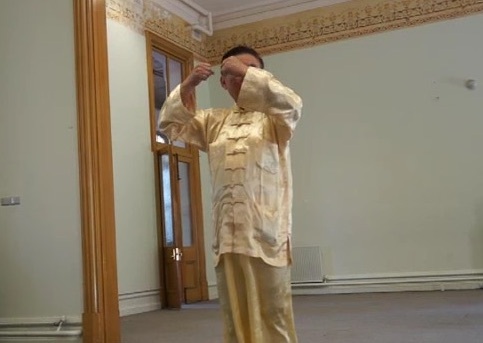 As an analogy, many people perform genuine Taijiquan techniques, but they lack the skills to use the techniques to develop internal force and to defend themselves. The third reason is that people do not believe the great benefits of chi kung. This is mainly because of the second reason that what is practiced as chi kung today is mostly gentle physical exercise, and not an energy art. Gentle physical exercise does not enable practitioners to overcome illness, have good health, vitality and longevity. If some practitioners overcome their illness, have good health, vitality and longevity, it is due to other factors, and not due to the gentle physical exercise they practice. Thus, although chi kung can overcome so-called incurable diseases, most people do not think it is true. Practitioners who practice genuine chi kung daily need not be sick at all, and they have vitality and longevity, but most people do not believe this fact, mainly because they see that others who practice gentle exercise, mistaken as chi kung, are still sick and weak. It is understandable if they are doubtful of the claims of chi kung, but it is shocking that they do not even take some effort to find out, especially those who suffer from so-called incurable diseases. As I have mentioned many times, that is their problem, not ours. If they wish to learn from us, even when they are skeptical, we shall teach as best as we can, but if they do not believe in what we say, it is not our business to convince them. This entry was posted in chi flow, Chi Kung, chi kung state of mind, Grandmaster Wong Kiew Kit, meditation, qigong, question-answer, Shaolin, Shaolin Wahnam, sinew metamorphosis and tagged chi flow, chi kung, chi kung state of mind, Grandmaster Wong Kiew Kit, meditation, Qigong, QUESTIONANSWERS, Shaolin, Shaolin Wahnam, sinew metamorphosis on July 11, 2017 by Wei Joo Lee.